was a brain split for some reason. refreshing look that a vector gives. the reason why the grass is up to his waist. wouldn't be visible to us since it would be on the ground naturally. Eeva vectored he looks like he really doesn't care about Lacus. Athrun's and hang out then listen to Lacus sing. 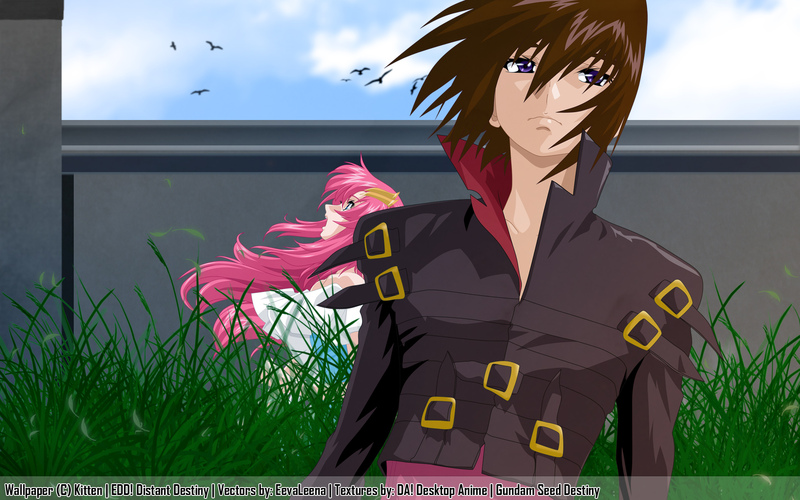 "Whatever, I'm going to Athrun's"
Good job, love the colours. Fab job, great wall, I love this! As Kashi, I'm also GSD hater, so I really like the idea of this. The atmosphere you created is really cool, very clever and yay for Kira. You know, I'm willing to see different styles from you. but i like it i rly do. Haha, this is a unique take on the scan. The idea of Kira going 'Whatever' at Lacus is refreshing. XD Really neat vectoring too! In before Kira Jesus Yamato and Athrun gay comics. Awesome statement, I support this wallpaper. AHAHAHAHAHAHAHAHAHA! I love the explanation. Yah, I'm and AthrunxKira fan myself, but don't the boys marry the girls at some point? Great wall, Kit. I love the title and the explanation.. I like the way you positioned the two and the background is real nice ^^.. Very cute pic. Kira is soooo sweet.